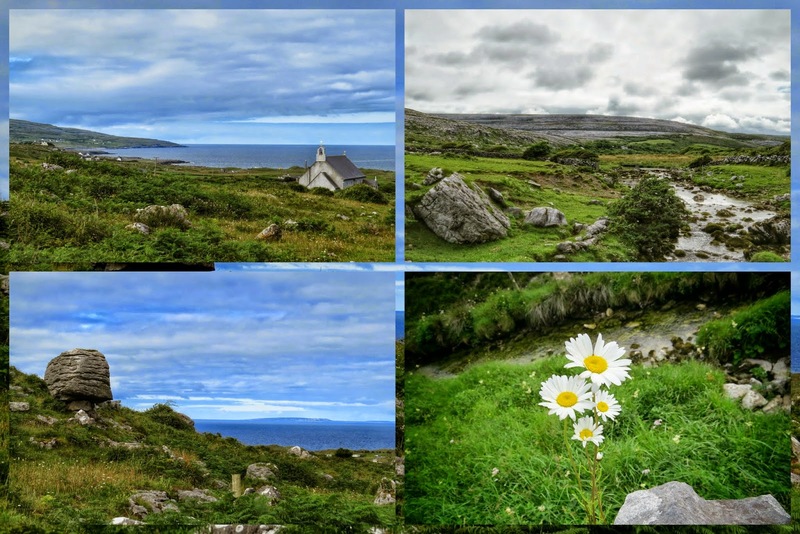 Every once in a while, we'll hire a car and explore some far-flung part of Ireland. 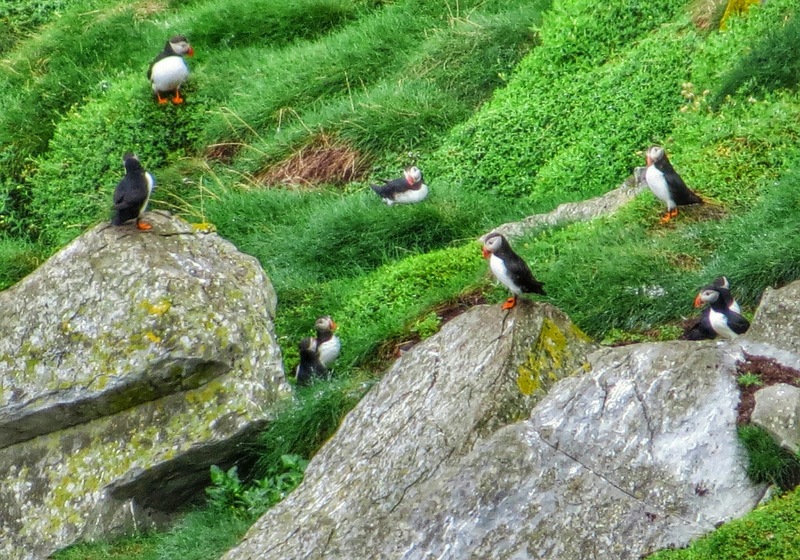 In this case, we were inspired to see puffins and as a result didn't stray too far from the tourist track. 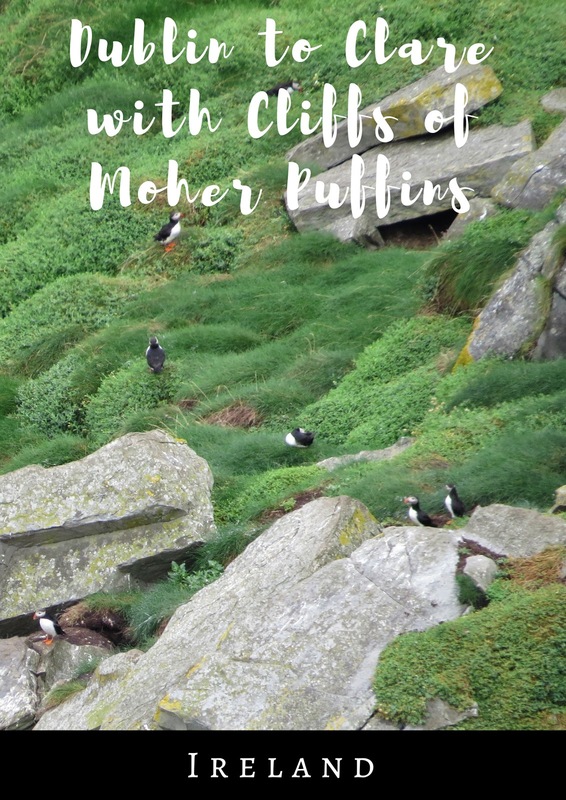 We didn't know when we visited in 2010 that the Cliffs of Moher are one of the few places in the world where you can see puffins from land at certain times of the year (May through July). I'm fascinating by these wonderful little birds so we decided to build a weekend around a trip to see them. 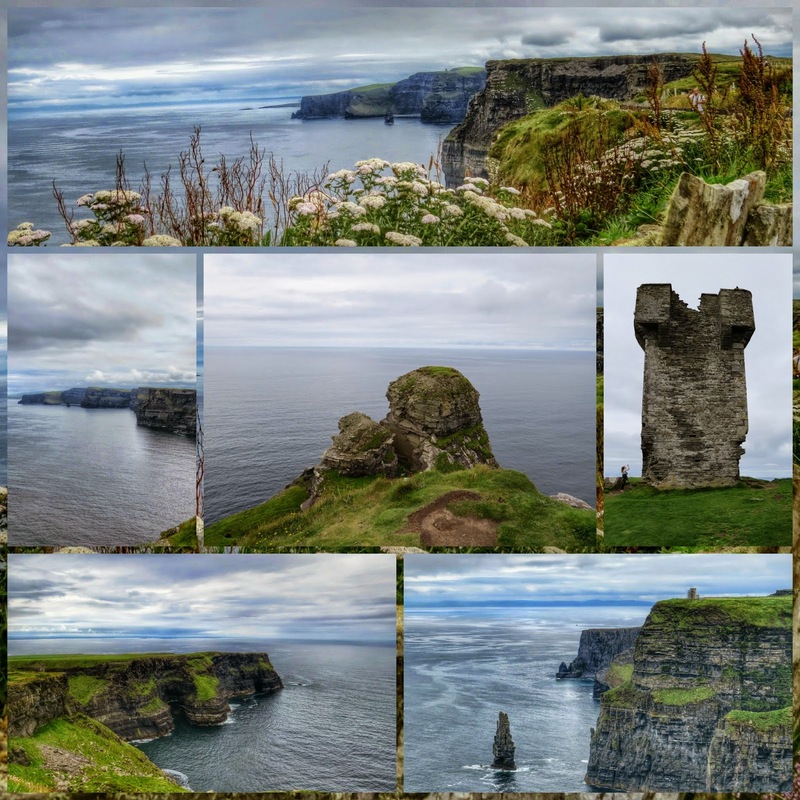 Here are some highlights from two days in the West of Ireland covering the Cliffs of Moher and the Burren with a few pitstops along the way. Irish people are fascinated by U.S. President Barack Obama and his visit in 2011 was well-received and widely followed. Obama claims his ancestral home is in Moneygall and he famously downed a pint of Guinness while visiting the small town. 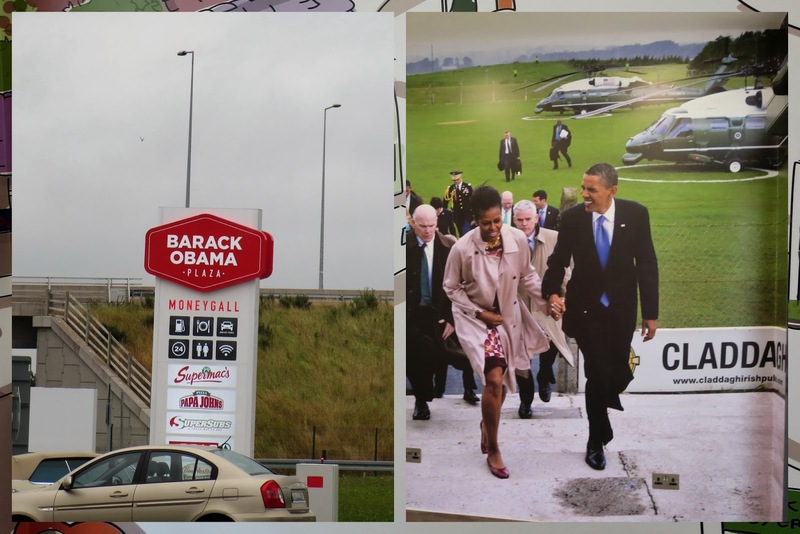 To commemorate the visit, the residents of Moneygall now have their very own Barack Obama Plaza (highway rest area) to call their own. It's conveniently located about halfway between Dublin and the Cliffs of Moher so we stopped in for a coffee and a snack. We were on the road by 7 am from Dublin in an attempt to beat the tourist hordes to the Cliffs of Moher. As you can see here, we did indeed benefit from being early risers. We were nearly the only ones there when we arrived at around 10 am and were treated to a solo performance by this man and his dog with stunning views of the cliffs behind. Straining to see the Puffins! We walked out onto the trail along the cliffs in search of puffins. We heard that they lived on a small island not far from the visitors center. As we were walking, I noticed an island dotted with small black and white spots. 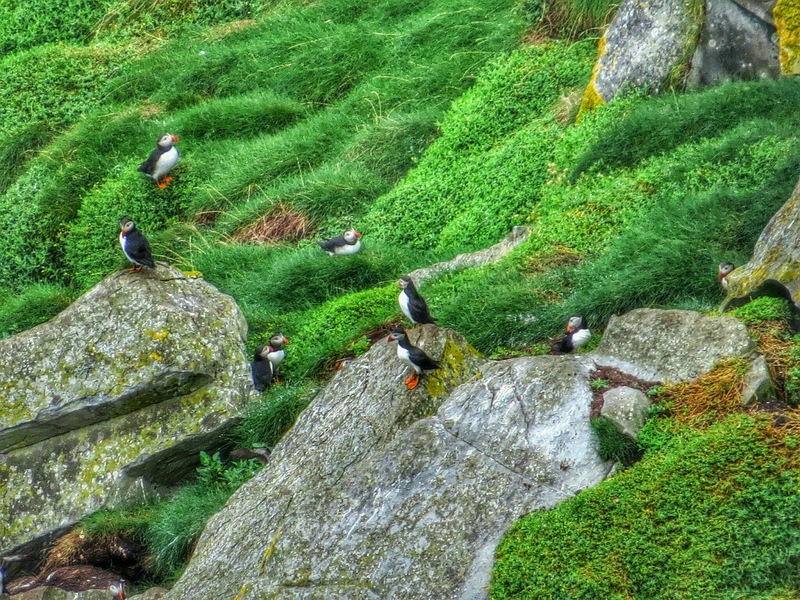 Straining to see with my binoculars, I soon excitedly realized that this island was simply covered in puffins! I wish I'd had slightly better binoculars and a camera with a bigger zoom lens. My camera can do up to 50x and was able to capture the pictures below. Mission accomplished! 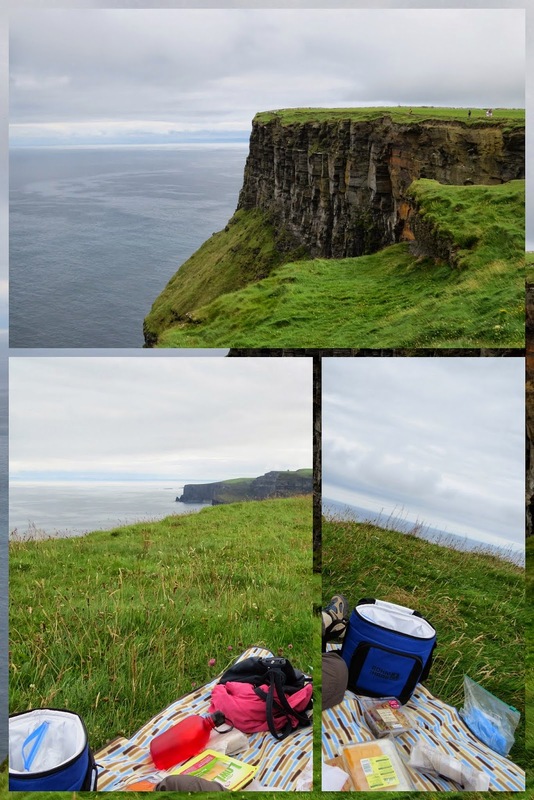 Hags Head is between 1.5 and 2 hours from the Cliffs of Moher visitors center and is a fairly accessible hike. We drank in stunning views along the way. While we visited early and the crowds were minimal, by the time we got back, the visitors center was swarming with tourists. The thickness of the crowds was directly proportional to the distance from the visitors center. 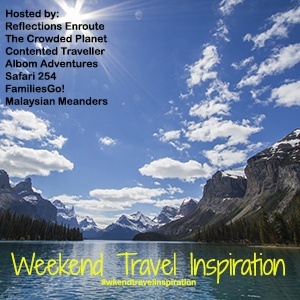 For a more serene visit, consider taking this beautiful hike. Just don't look down...Much of the trail runs along cliff's edge. En route to Hags Head, we spread out a picnic blanket in a grassy area and stopped for a peaceful picnic lunch with stunning views. A picnic is great way to break up the relatively long walk to Hags Head. 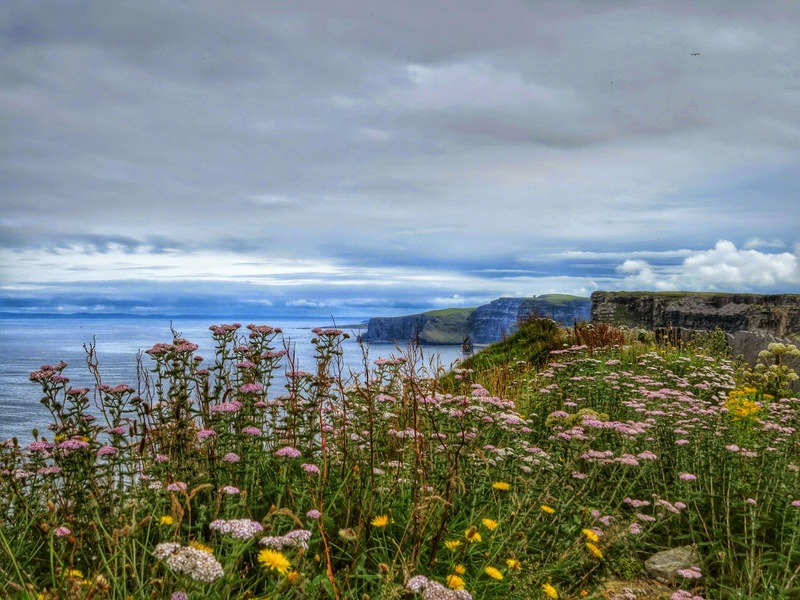 In addition to puffins, the Cliffs of Moher are home to countless seabirds and other species. We were lucky enough to spot several species on our hike including this cheeky rook in the parking lot. I love a great view. There is nothing I like more except maybe a view framed by wildflowers. Our hike to Hags Head took us past riotous patches of summer flowers. After all the excitement seeing puffins and taking a hike at the Cliffs of Moher, we drove towards the Burren. 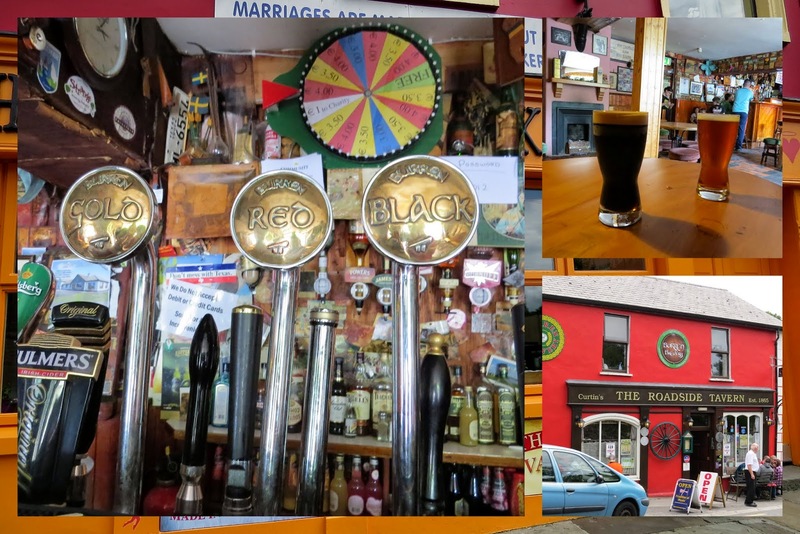 We stopped in the colorful little town of Lisdoonvarna which is most famous for its matchmaking festival. We took the opportunity to stop at the Roadside Tavern for a glass of craft beer (pick Gold, Red, or Black). We limited ourselves to just a glass as we were driving shortly after. 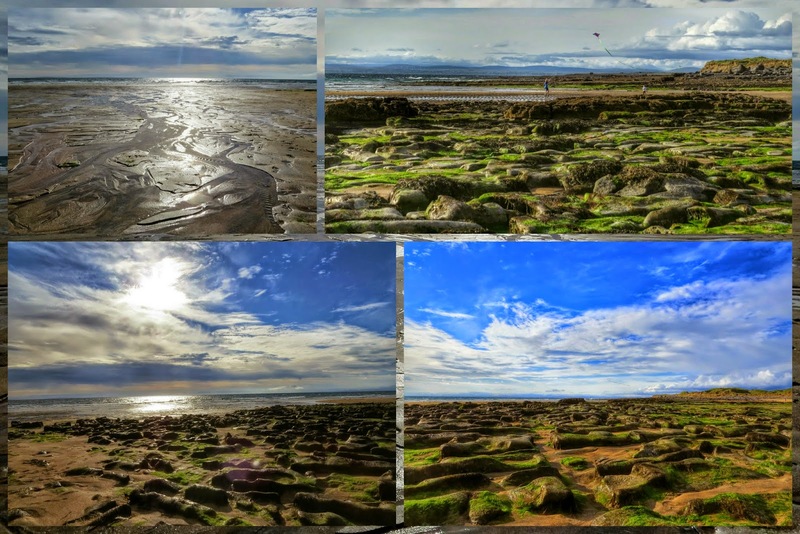 The Burren is a landscape unique in the world. Millions of years ago, it was actually on the sea floor. Cracked gray slabs of rock lead out to the sea. Verdant pastures sit at the base of rocky hills. When various weather patterns roll in, the photographic effect is stunning. 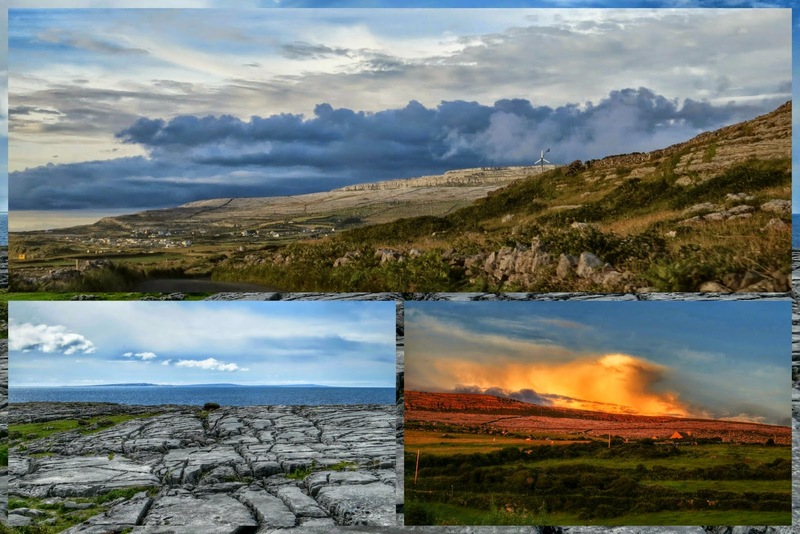 Fanore is a small town in the Burren in Co. Clare and would be our home for the night. We went down to Fanore Beach at dusk and drank in the spectacular views as we walked in the sand. Many Irish people that I've talked to since remember Fanore fondly as a holiday destination from their childhood. I'm glad we had a chance to visit and recreate this typical Irish family trip if only just for one day. 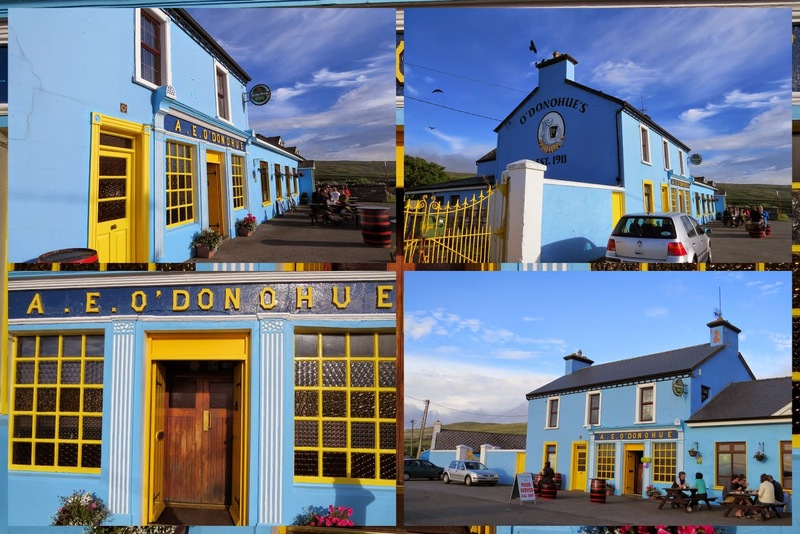 In Fanore, there is basically one place you can go for dinner...O'Donoghue's Pub. You can't miss this bright blue building with yellow trim as you're driving through. We stopped in for their famous fish and chips. Ballyvaughan is the next closest town to get decent food. Seeing that road the next day, I'm really glad we stayed 'local' as the ride would have been slightly harrowing especially after a full day on the road. Can you believe we'd packed all this in in a day and had left Dublin that same morning! O'Donoghue's was just what the doctor ordered to finish off our day. The nice thing about roadtrips is that you can pack more than a backpack (carry-on luggage size for Ryanair). 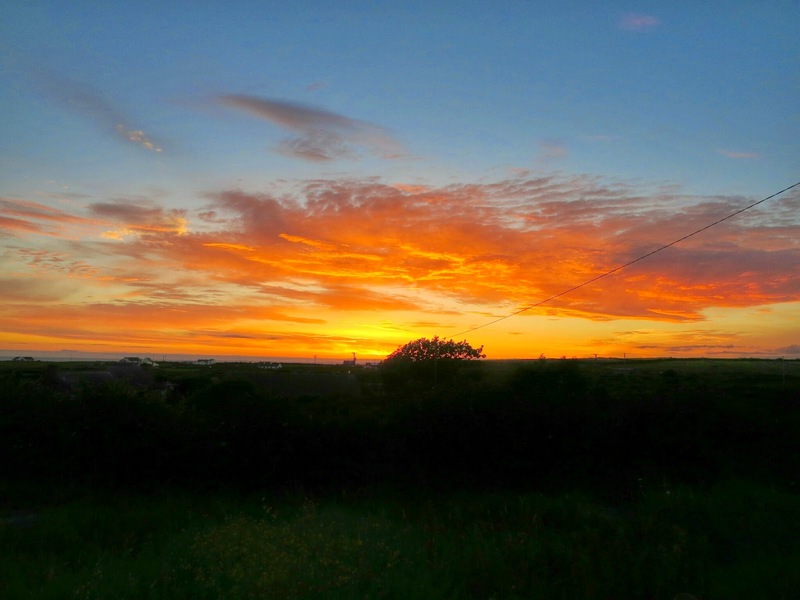 We actually popped a bottle of wine in the boot of the car that morning and had a glass while watching the sunset at our Bed and Breakfast (Rocky View Farmhouse). The experience was truly exceptional as we watched the sun slip below the horizon against the backdrop of the Atlantic Ocean and Aran Islands. We woke up early the next day, ate breakfast at our B and B, and took a hike nearby before checking out and beginning the drive toward home. 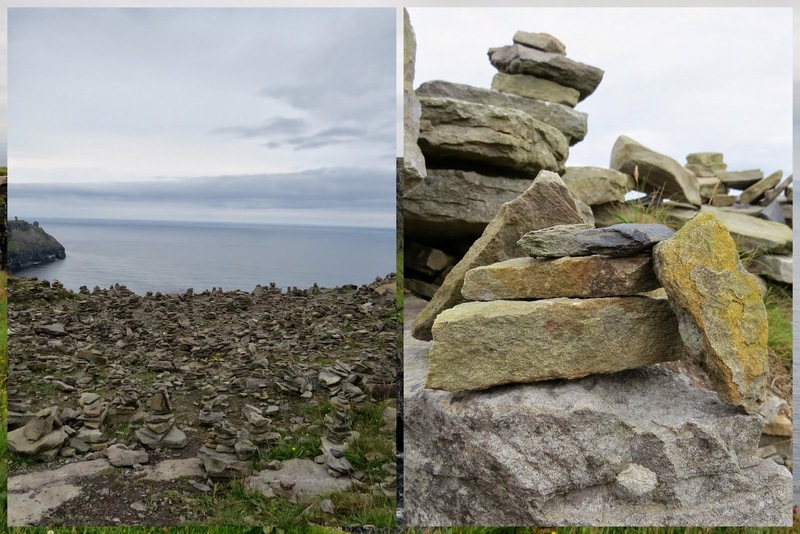 Once again, the unique landscape of the Burren enchanted us as we explored the area on foot. 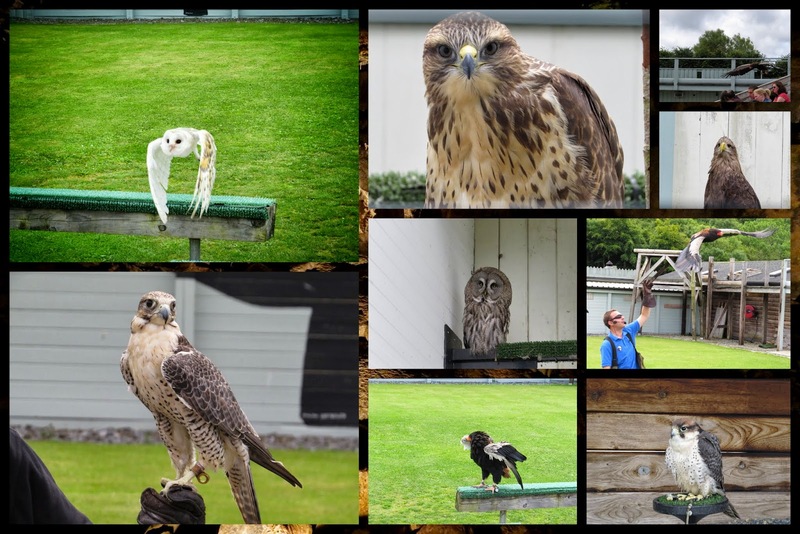 The Aillwee Caves Birds of Prey Center was a fun stopping point on our way home. It was about 30-45 minutes from where we'd been staying in Fanore. We arrived in time to have a quick walk around to see the different birds of prey in residence up close before settling in for the show where handlers 'flew' different birds for the audience to see. The best part is that audience members had the opportunity to 'have a go', don a protective glove, and have the bird land on it. I got to hold the African raptor in the lower center picture. The hawks are much lighter than they look. That fellow only weighed about four pounds. The Center was really well-run and educational. We also went to see the Aillwee Caves on a combination ticket. That was also interesting but it you've seen one cave in your life, there isn't really much new to see here. The birds were definitely the highlight for us! The other great thing about roadtrips is that you have the ultimate flexibility to stop whenever and wherever you want. Our stomachs were rumbling in the late afternoon and we consulted the map for possible candidates for an early dinner. 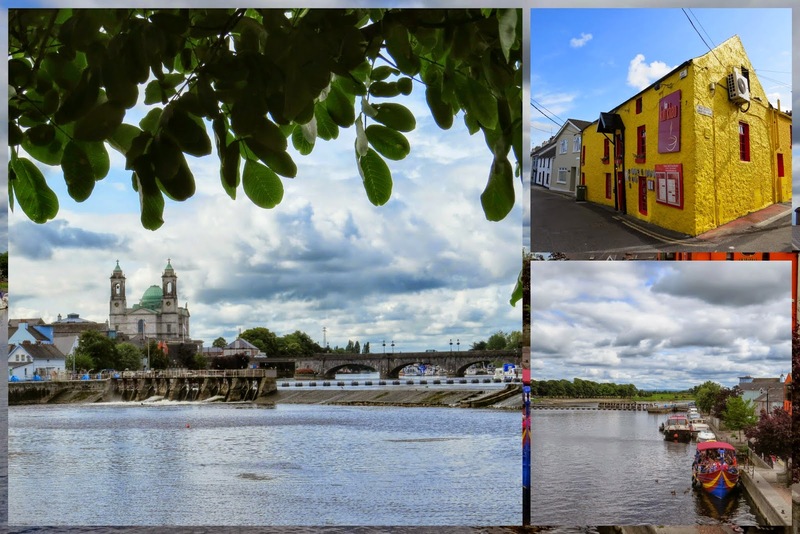 Athlone stood out as the biggest town nearby. We'd seen the town in the past as the train passed through and were curious about it so decided to get off the motorway and check it out. We had coffee and cake along the river, took a hike to Burgess Park to admire the locks along the River Shannon, and ate a fantastic Thai meal at Kin Khao before finishing the remaining 1.5 hour drive back to Dublin. We accomplished a lot during a very short period of time out West. We can't wait to explore even more. We've been to Cork, Galway, Kerry, Waterford, Wexford, Donegal, Derry, Westport (Co. Mayo) and more. Where should we head next? 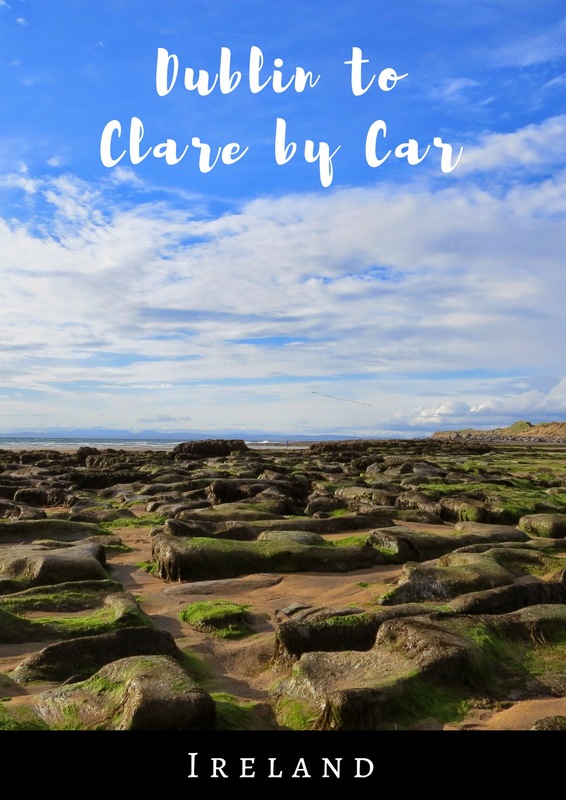 Read about a road trip from Dublin to Clare by car. 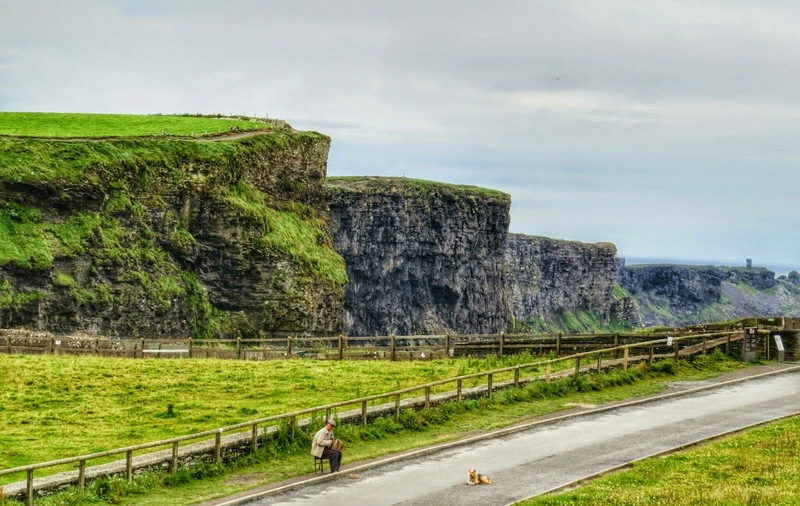 Travel from Dublin to the Cliffs of Moher by car. 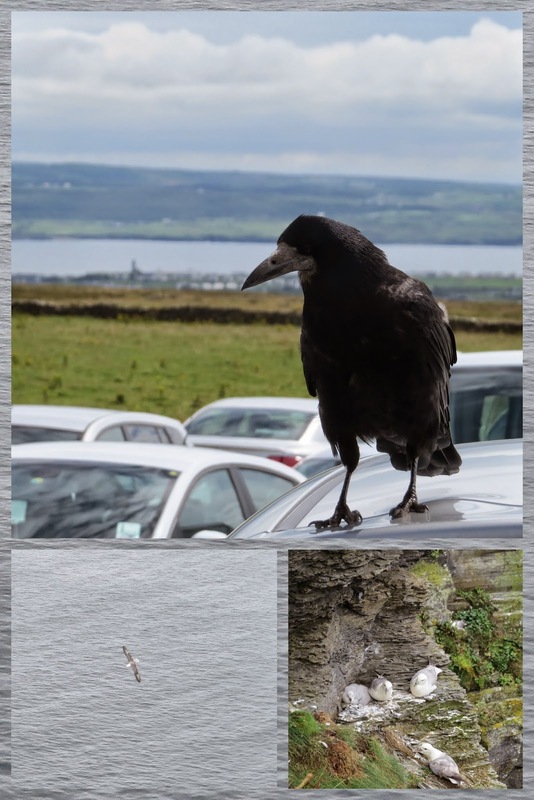 See Cliffs of Moher puffins along the way.